Celesteela in game: 922 Who? Important notice! Pokemon Celesteela is a fictional character of humans. Celesteela (Japanese: ????? Tekkaguya) is a dual-type Steel/Flying Pokémon introduced in Generation VII. It is one of the Ultra Beasts and is known by the code name UB-04 Blaster (Japanese: UB04 Blaster). 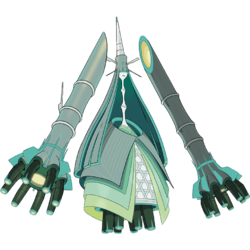 Celesteela is a large, humanoid Pokémon that is mainly green, with a bodily construction that closely resembles that of a bamboo shoot. It has a horn, that resembles a drill bit that appears to be atop of a structure that is similar to a hat with two small green spots. There is another structure that stems from the "hat" that resembles hair. The lower half of its head is small, with a tiny mouth. Its long neck is divided into three segments; each one of the segments resembles a long, individual neck. Its lower body consists of a structure that is similar to a dress colored in different shades of green. Below the dress, there is what appears to be bamboo stalks. Its huge, disembodied arms resemble stalks of bamboo, with similar projections surrounding a larger opening. According to the Aether Foundation, its most distinctive feature is the energy that it stores within itself: a flammable gas that it can shoot from its two huge arms. This is mostly used to propel itself in flight and for battle, but it is thought to have sufficient power and lift to even fly into space. Despite being a Steel type, Celesteela's body is plantlike and can absorb nutrients from the soil. At 2204.4 lbs. (999.9 kg), Celesteela is tied with Cosmoem as the heaviest known Pokémon. Celesteela is likely based on Princess Kaguya from The Tale of the Bamboo Cutter: its body resembles bamboo shoots, its arms resemble cut bamboo trunks, and its overall shape resembles a space shuttle. It may also incorporate similarities to the spacecraft SELENE (nicknamed "Kaguya" in Japan), which orbited the Moon between 2007 and 2009. 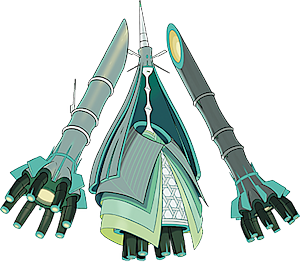 Celesteela may also be based off of a Bamboo Rocket. Tekkaguya may be a combination of ?? tekka (gunfire), ?? tekko (steel), and ???? Kaguya-hime (Princess Kaguya).